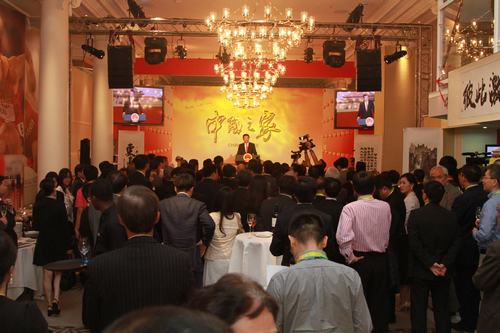 Two weeks ago when President Liu Peng and I opened 'China House', I told you that I would throw a victory party here for the Chinese Olympic athletes. Now it is time to deliver my promise! 'China House' tonight is shining with a galaxy of stars. 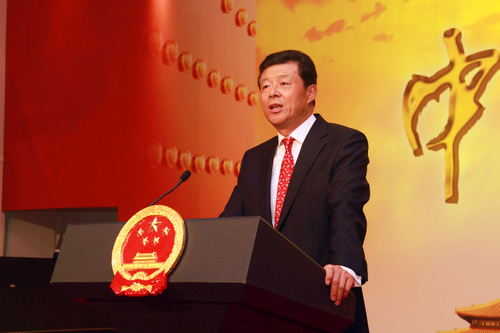 I want to warmly congratulate the whole Chinese Olympic Corps for your heroic exploits. You have distinguished yourselves in the following aspects. First, you demonstrated the exceptional athletic standards of China. In the 13 days since opening of the Games, we have been overwhelmed by the stunning performance of the Chinese delegation. In this Olympics, you have brought us so many surprises. You won the very first gold medal and the first new world record; then China's first Olympic gold medals in men's swimming and men's foil; also all five gold medals in badminton and once again all four medals in table tennis. All these successes reflect the formidable competing capabilities of Chinese athletes. They also won great credit for China and the Chinese nation. 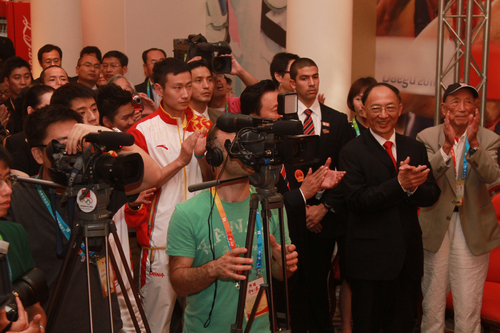 My colleagues and I went to many of the events to cheer Chinese athletes and witnessed numerous historic moments. I have to say that you have made us profoundly proud. You have not only won gold, silver and bronze medals, but also created Olympic heroes and enhanced the prestige of China. We are honoured to have invited here some of the heroes. There is the Chief Coach for women's individual event for the Chinese national badminton team, Madame Tang Xuehua; there is the gold medalist for individual men's table tennis, Zhang Jike; gold medalist in women's individual badminton, Li Xuerui; gold medalist in the table tennis women's individual and women's team, Li Xiaoxia; gold medalist in mixed doubles badminton, Zhang Nan, gold medalist in the badminton mixed doubles and women's doubles, Zhao Yunlei. Let us once again give them a big round of applause! Second, all of you displayed true sportsmanship and Olympic spirit. Chinese athletes gritted their teeth and stiffened their sinews to fulfill the Olympic motto of faster, higher and stronger. The way you handled the intense spotlight and pressure is also what I greatly admired. For example, the 16-year old prodigy swimmer, Ye Shiwen, confronted doubts with composure and proved herself in the pool. Weightlifter Lu Haojie fought through despite his injury. He won a silver medal with a successful lift of 190 kg in the clean and jerk. That silver meant much more than gold as his bravery and perseverance won over the support of the entire audience. Many other athletes viewed the competition results with a highly admirable attitude. As one of them rightly said: "It is not that only the top three are winners. We are all winners as long as we compete with true sportsmanship." Third, you built friendships with other competitors. While competing aggressively, Chinese athletes also learnt from their opponents and congratulated them on their success. This attitude really showed the warmth and values of the Olympic family. The Olympics are also a stage for multilateral diplomacy. Everyone of you is an envoy of friendship. You are the assets and resources of China to enhance the reputation and appeal of our country; in turn this builds Chinese influence globally. There is no doubt that our athletes are heroes. But we should not forget the large supporting team behind them. Here are some of the highlights about those that support our heroes. Coaches played a huge role in training and formulating competing tactics. The support staff of the delegation impressed us with the quality of its logistics service. Journalists shuttled between the venues and brought us real time record of those exciting moments. The Chinese community, students from China in Britain and spectators from China cheered on every event. They greatly motivated our athletes. The glory of our Chinese Olympic athletes echoes the growth of China. A growing China has offered a platform never seen before for Chinese athletes to pursue their Olympic dreams. Here I want to introduce you a special guest. This is 88-year old Mr. Wu Chengzhang, who was a basketball player. Mr. Wu played on behalf of China in the 1948 Olympic Games in London. The government of old China in 1948 could not even afford the traveling expenses of the Chinese team. I am sure that back in London this time, Mr. Wu must be immensely proud of today's China. I understand that one thing you are most eager to do now is to go home and share with your family the excitement of your success. But before you go back, let us enjoy a relaxing and pleasant night in this 'China House'. This is a house far from China yet warm in its welcome of any Chinese home. I wish you a safe journey home and greater success in the future.